In this review, you can find our detailed review on MyPrivateProxy.net which ranks #1 dedicated proxy service provider. For after reviewed and tested lots of proxy services, I can say that Myprivateproxy can be considered as “all around” dedicated proxies providers. Many proxy services have emerged in recent years to provide customers with proxy IPs that can be used either for growth of your business or if you want to just Netflix and chill from a geo-restricted location. But out of so many services available currently, to find the best suit for your needs can be a daunting task. Our series of reviews is aimed at helping you find the service that works best for you. In this article, you can find our detailed review on ‘My Private Proxy’, also known as MPP Group, which has already attracted our attention with its long list of features. We dissected the features up and down and put it through our intensive 3 stages testing to find its best features and worst flaws. Read on to learn more. ‘My Private Proxy’ is offered by MPP Group which was founded in 2011 and headquartered in Seychelles, a small island nation state in the middle of Indian Ocean. For the past seven years, it has steadily grown and now boasts a huge proxy network of more than 150,000 IPs worldwide, distributed across 8 countries. To review the overall performance and user experience of ‘My Private Proxy’, we bought 10 private proxies to test their proxies ourselve. After a week of testing, we have found some pros and cons of the service. You can find about them below. Diverse packages of private proxies, ranging from a single proxy to 2000 or custom packages. Dedicated proxy plans for Sneakers Sites, PokemonGo and Ticketing sites. More than 27 locations worldwide, distributed in eight countries in the USA and Europe. Dual mode authentication – supports both IP authorization and username-password authorization. Award winning service with very responsive customer support center. Instant delivery of proxies upon payment. Up to 128 TCP sessions to each proxy per second. Does not offer trial usage before buying proxies. Currently, ‘My Private Proxy’ offers both private proxies and shared proxies. But in this review series, we’re focusing on only private proxies and so will limit the review to the private proxies. Although it is listed on their website, it seems that their VPN service is not presently offered. 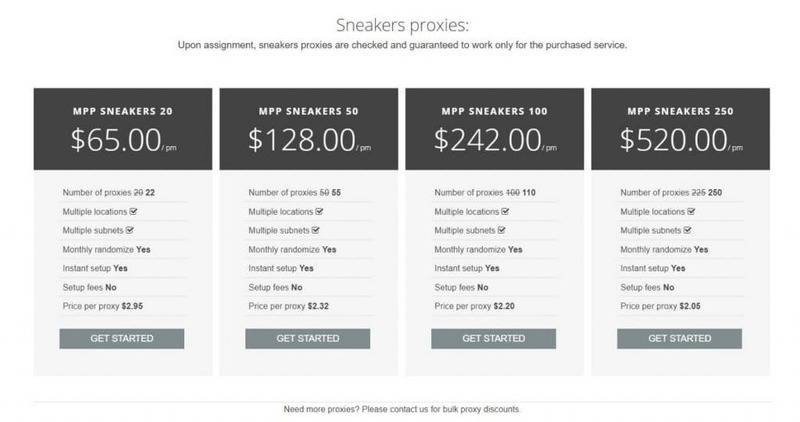 Private proxies offered by ‘My Private Proxy’ are for general purpose use, but they also have dedicated proxy packages for Sneakers Sites (ie, Adidas, Nike, Yeezy etc. ), PokemonGo and Ticketing sites (ie, Tickets, Ticketmaster etc.). The general-purpose proxies can be used for all other kinds of usage except for sneakers sites, pokemon go and ticketing sites. We found the social media sites to be initially blocked, but after contacting support, they enabled access to all the social media sites. ‘My Private Proxy’ has a well-organized pricing comparison page for you to choose from. You can buy as low as a single proxy for only $2.49 USD per month if you’re a home user or want to test their service before buying larger packages. They offer up to 2000 proxies package (with bonus 200 proxies) for only $2500 USD. This accounts to only $1.13 per proxy per month, which is comparatively cheaper than many other services. The full pricing plans is given below. If you require a custom plan, you’ll need to contact the support by issuing a support ticket. The support is very responsive and will get back to you soon. MyPrivateProxy.net has a large network of proxy servers located at multiple locations in the USA and Europe. The number of locations available to each package varies, but at most, you can receive proxies from up to 14 different cities while buying your proxy plans. They don’t let you choose the specific locations while buying, but if you require specific locations, you can contact support to resolve this issue. A page on their website lists all their locations in an interactive map including the server hardware configurations, which are of very high specifications. We purchased 10 private proxies from ‘My Private Proxy’ to perform our tests. We performed four stand alone tests on the proxies to find out how suitable the service is for general usage. Let’s check the Myprivateproxy’s Proxy ping and speed performance. We performed a speed test on the proxies bought from ‘My Private Proxy’. Their servers are connected to very high-speed internet connections and we hoped to have a decent speed using the proxies. And we weren’t disappointed at all! A speed test lets us determine whether using the proxies lets you have a good browsing experience while watching videos or sharing files. We performed our speed test using the no. 1 internet speed testing site, speedtest.net to test the connection speed. According to the test site, our internet connection speed is 69.76 Mbps for downloading and 461.57 Mbps for uploading. After configuring proxies from ‘My Private Proxy’, we found the new speed test to be similar. Although the proxy speed does bottleneck at our moderate internet speed, it shouldn’t cause any jitter on daily usage and you can browse the internet, stream videos and share files with a very fast connection speed. The speed is also acceptable for most of the business purposes. The ping test we performed was to test the latency using whoer.net to check the ping of the proxies in different locations. If the sites you are visiting have servers near the proxy server, it’ll ensure a very fast connection with low ping. This is evident from our test results. All the proxies we received were in the USA and so had a significantly lower ping for the test locations in the USA and Canada. The ping result is acceptable for most of the businesses. You can see the test results below. We performed a location test to verify the locations we received and whether they really did provide proxies located at 3 different cities, as mentioned in the pricing plan. The result is much impressive than we expected. We choose our desired proxies to be in the USA and the proxies we received are indeed in the USA, and the 10 proxies are distributed across 5 different states, which is highly appreciable. Proxy IPs from the same state are sequential, but even if one set of proxies get banned, there’s still room for other sets to work uninterrupted. The ISP names are different from each other as well, although different test sites showed different ISP names. Here is the geolocation test of ‘My Private Proxy’ that we performed. We also tested if many high demand sites such as social media sites, amazon, craigslist, sneakers sites etc. are accessible using the proxies. The result is not far from expectation as ‘My Private Proxy’ clearly mentions that sneakers sites are blocked from accessing via general purpose private proxies. But rest of the websites we tested were accessible. *IG – Instagram, CL – Craigslist. You can get new proxies once every month, starting from the second month of your subscription. For example, if you started the subscription on September 18, then you can receive new proxies any time after October 18. You can request for the new set of proxies manually from control panel when you need, or you can also set it to automatically refresh proxies every month. If you set automatic proxy refresh, your proxies will be replacing the next day after order day, monthly. Only a handful top class proxy providers let the users access their API to simplify using the service. Although you can perform many tasks manually in your proxy panel, by using API, you can automatically fetch your proxy servers list, perform proxies refresh for a proxy plan, enable or disable auto refresh of your proxies for some proxy plan. ‘My Private Proxy’ does not have a trial proxy policy, but you can buy a single proxy to check if their proxies are suitable for your purpose. They also have a 3-days refund policy for selected packages that will be helpful if you find the proxies to be not suitable for your specific work. ‘My Private Proxy’ does not offer refund for their dedicated packages and only a few private packages, so do go through their refund policy before relying on that. ‘My Private Proxy’ has a very responsive customer support to help you solve any issues that may arise. They are very quick in replying as well. We contacted their support center to check whether they allow using social media sites with the general-purpose proxies as they were initially blocked in our package. They quickly replied and informed us that enabling social media sites will allow us to log in to any social media site with no further restrictions. ‘My Private Proxy’ has proxy servers in both the USA and in Europe. However, they don’t have servers in other continents, whereas many new proxy providers are setting servers in as many locations as possible. We feel that they need to add more locations to their fleet of proxy servers. The proxy servers of ‘My Private Proxy’ are of very high configurations and especially suitable for as proxy servers. They also are moving towards an energy efficient power system and already running their Denver server with renewable energy. One very impressive thing about ‘My Private Proxy’ is their very easy sign-up process. You can easily find your desired package from the navigation menu of their website. You can select the purpose you’re buying the proxies and server locations. They accept several payment methods including PayPal, Credit Cards (via 2checkout). As we have mentioned earlier, ‘My Private Proxy’ lets you choose only the continent and not specific country/states. But if you need specific locations, you can contact their very responsive customer support by ticket. ‘My Private Proxy’ allows you to choose either IP based authentication or username authentication easily from the control panel. There’s no need to contact support if you want to change from one method to other. You can authorize up to 10 IPs. Whether you choose IP authorization or Username authorization, you’ll need to configure the proxy settings in your web browser or other application where you want to use the proxy. The option to add proxy IP and port number is usually found under the Network panel of the Settings menu. If you use IP authorization, you’ll need to authorize your current IP in the proxy control panel of My Private Proxy to be able to use the proxies. For username-based authentication, only the username and password is needed to be entered. You can also set the system proxy to avoid configuring for each application. It is also possible to use the proxies in your smartphone. You can add the proxies in the Wifi Settings menu of your mobile. ‘My Private Proxy’ is one of the most favorite names when it comes to proxy services. In the past seven years of their service, they have received some excellent feedbacks from their users. They continue to offer services and features that will only take them further. We liked many aspects of their service, but the most important of those are, their dedication towards customer dedication. Their entire business is customer focused and they proved this from setting competitive pricing plans to making a user-friendly website to dedicated control panel. We are pretty satisfied with their service and would happily rank them as our no. 1 choice for proxy service.